Sometimes, you go past a building that piques your interest but not enough for you to stop and really look at it. Perhaps it is because you happen to be in a hurry. Or else because it is somewhere that you can get to easily so there seems to be no urgency to make the effort of finding some time to absorb it all in. “It’ll be for another day,” you tell yourself. Only that other day never seems to come. How many people have done that with St. Agatha’s Chapel? Certainly many pass by it daily, seeing that it guards a pretty busy side-road that links Zurrieq to Hal Far. Perhaps they do so because it isn’t a particularly pretentious building but, in doing so, they’re ignoring the links that it has to their roots. St Agatha is actually one of Malta’s patron saints. Legend has it that she came to the island as she was fleeing from her native Sicily and the Roman persecution of Christians. Regardless of how much (or how little) truth there is in this story, it certainly looks as if there was quite a following for this Saint in Malta. Indeed, in 1551 her intercession through a reported apparition to a Benedictine nun is said to have saved Malta from Turkish invasion. The devotion of St. Agatha in Zurrieq dates earlier than that. 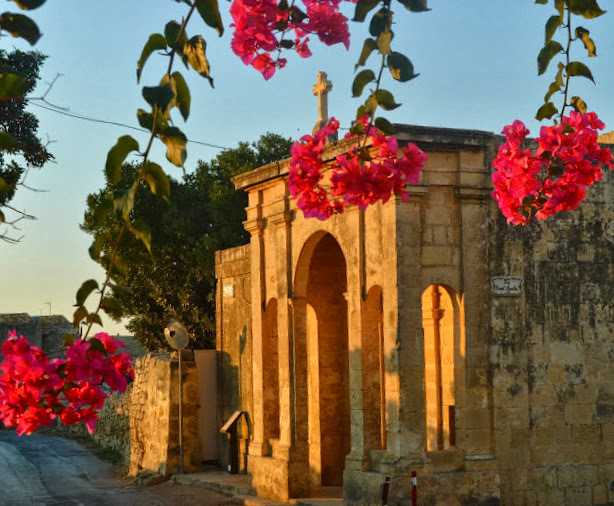 By 1428, there already was a chapel built dedicated to her and this was popular enough for the area to become known as Ta’ Sant’ Agatha (of St. Agatha). By the start of the seventeenth century there even was a small cemetery next to it and the feast was celebrated on the 5th of February. Eventually, however, it fell into disrepair and the current chapel was built in 1854 by a local patron. The two small front windows are kept open so that any devotees passing by can stop to say a prayer to St. Agatha even if the chapel happens to be closed. A reminder that there was a time that people used to stop here to think, rather than rush by. Want to visit the Chapel of St. Agatha? Directions can be found here.